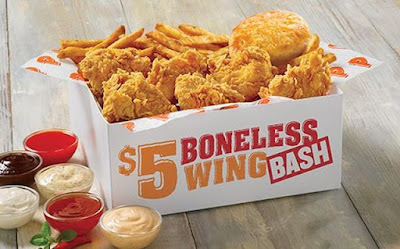 Popeyes' latest deal sees the return of the $5 Boneless Wing Bash Meal for a limited time at participating locations. The special includes six boneless wings, a side, a biscuit, and a choice of dipping sauce for $5. The deal was first introduced earlier this summer. The $5 Boneless Wing Bash will be available through December 24, 2016, while supplies last.